So recently TRU purchased a UAV or as they are more commonly known as a Drone. I am sharing responsibility of using/flying/piloting it with one other campus employee at this time. For now I have had exclusive access to it and it is amazing. We picked the DJI Inspire 1 for ease of use and camera quality. I love this machine. It is so great in design and usability. As well, the camera has exceeded my expectations in terms of resolution and stability. My first flight ended in a disaster and I broke a couple props. Luckily DJI was smart enough to include multiples. Next flight I only lost one prop. I am now skilled/careful enough that I haven’t broken anything else. So far I have logged 1hr and 49 minutes of flight time at 15 minutes or less of each session due to battery life. 14,808 meters of flight distance, and a total of 19 flights over 9 days. Not sure what the app considers a flight since, over the 9 days I have had full sessions of 15 minutes or less. ie I didn’t land and then take off again, but kept it in the air for as long as the battery lasted. Initially the machine was set to beginner mode and would stay within 30m, either due to the amount of flying time or some other factor I can now fly as far as I want away, and 119meters straight up. I didn’t disengage the beginner mode as far as I know so it is interesting that I was graduated. Since the UAV is so steady and has such a wide angle of view we are hoping we can position it, snap some photos and turn it into a nice quick 360 pano in some exciting positions. Not very clear, but bokeh is the circular patterns that out of focus pin points of light make. The arrows point to digital artifacts due to the codec messing up fine lines. The little grey squares dance around on Patricks eyes. So from now on I will be using my trusty Panasonic. Youshow Daily #27 20sec audio, where am I? Very simple audio composition built on one sound. Over the years I used to try to keep track of what I read. Slips of paper and scribbled notes blew around the house and drawers and backpacks. Then I found Goodreads. The first year I used it in 2003 I read 29 books. Last year I managed 17. Although I have 5 or 6 that I started in 2014 and hadn’t finished before the 1st of January. This is part of what I am reading over the next while. I am tempted to bore you to death with why all of these books are on my shelf. What I think of them before reading and what I think of them after reading. 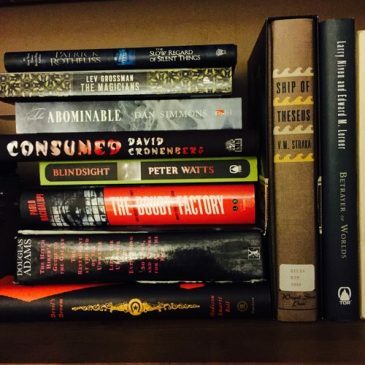 I have realized that I go through cycles of reading physical books, then online only (blogs, Reddit, Facebook, etc). Not sure why I make the switch. I guess the point of this post is to remind myself to keep reading, and that GoodReads has been a good app for me. D’arcy said that he likes doing the photo a day challenge because it helps keep the memories accessible. He can remember each and every photo. 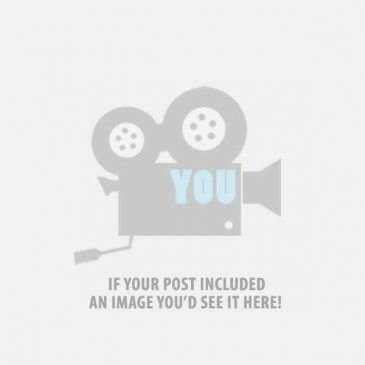 It is the same with blog posts and other online writing and image posting. Helps me to remember. So in my other life away from TRU I am the current Chair of the Kamloops Film Series. This is a series of feature films we show in three series; Spring, Winter, and Fall. The final film in our Fall series of 2014 we showed the wildly popular The 100-Year Old Man Who Jumped Out The Window and Disappeared. It was our first Series sellout in many years. We had some technical problems with the digital version of the film. What happens now in modern cinemas is the distributor will send out a DCP which is a hard drive containing many versions of the film. The different versions may be a dubbed version, an English Subtitled version, and a French Subtitled version. This DCP is ingested into a computer at the theatre a few days before the screening. The manufacturer of the DCP will then send via email and electronic code called the KDN. This digitally unlocks the version of the film for a specific duration of time. All of this to avoid piracy. Before the screening of the 100-Year Old Man the server crashed and was no longer accepting the KDN. So, the theatre manager frantically tried to contact the distributor, and the manufacturer to get a new KDN. We finally got it 5 minutes after the film was scheduled to start. Which is fine since I was delaying the start to allow the large crowd to find popcorn and seats. An average Film Series screening is about 240 people. We had close to 500 in the theatre. The film starts with the 100 Year Old man himself narrating his childhood. We catch up to the modern era where he is waiting in his nursing home room for the staff and mayor to come in with a cake to celebrate his birthday. Suddenly all the characters are speaking Swedish. This goes on for too long with no subtitles. With a big sigh I get out of my seat and find the manager. She tries to restart the film with subtitles as I announce what is happening to the expectant crowd. We restart and again no subtitles. With no other recourse I let it run. As it turns out there are about 5 different languages including English throughout the film. For the most part the film is a slap stick comedy so you can get the gist of what is happening. Also a large part of the crowd were not regular Film Series audience but came because the film is based on a very popular novel of the same name. Basically we had about 20 people leave but the rest stuck it out. Amazingly the audience was talking and laughing as they were leaving in a way that normally didn’t happen after a film series screening. 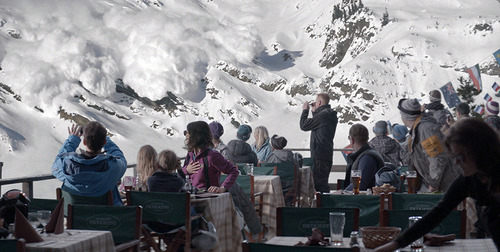 So with trepidation we screened Force Majeure last night. Another Swedish film with English subtitles. I contacted the manufacture to confirm the KDN was correct and we would have a version of the film with the subtitles. Everything went well. The movie was tremendously powerful. But then during the final moments of the film the lights suddenly went up and the screen went black. No credits just black screen. I jumped up and tried to find the theatre manager, but she wasn’t there, so the kid working there called her and got directions on how to restart the film. While he was working on that I went to the front of the theatre and announced we were going to try to restart, but by now a large portion of the audience left. So we scroll through the opening trailers and finally can fast forward to the point in the film where we left off. People file back in, mostly standing in the aisles. The film starts where we left off and then 20 seconds later ends and the credits start to roll. So we lost only 20-30 seconds in the first instance. I was furious. Had a couple people comment their disappointment to me as they were leaving but none more disappointed than me. So what happened? The manager programmed a start and end time for the show but because of the trailers that played before the film it pushed the film past that time. I was so frustrated because I am the public face and the majority of the audience doesn’t know how this kind of problem occurs and assumes it is my incompetence. The amazing thing was everyone laughed quite a bit when we all realized that we had only missed 30 seconds of watching a group of people walk down a mountain road. The abrupt ending we had first experience thematically mirror the shock and chaos of the avalanche scene in the film. These two events have made me realize the strong sense of community that our audience has. Before the screening I was also pondering getting rid of selling our membership cards separately and just adding the membership to the tickets to make the process at the door smoother. I voiced this thought to friend, as we were chatting. He said he thought that would probably be a mistake because people liked having this little card to let them identify with this community called the Kamloops Film Society and it possibly gives them that sense of belonging. The shared experience of sitting through an entire film with no subtitles and laughing not only at a film you can barely understand but also the absurdity of the situation was something that probably wouldn’t have happened with just a general audience. Our audience knows they are part of a group, they recognize each other from the various screenings over the years. This is why I feel the Film Society is important to Kamloops. Nobody would have continued to watch a film without subtitles on Netflix. But sitting together, laughing together and coming out with smiles acknowledging that we had all gone through this experience together. Very memorable. Do I have a communication shape? I think it may be a crumbling slope, maybe a slump. I have systematically done less and less writing since leaving University. Short sweet and to the point is often my modus operandi now. Running after small children kind of gets in the way of sitting in a café with a notepad. 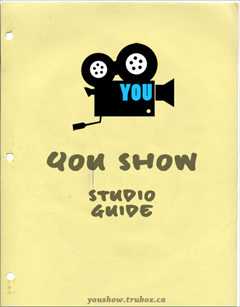 I am excited for the Youshow to help me start to flex those writing muscles again. So a quick stretch and let’s hit the ‘gym’. My job is very visual. I capture content on video either through a camera, or downloading content already posted on the web. I manipulate these sequences of images into something that hopefully is engaging and relevant to students. Most of my projects are based around interviewing subject matter experts. For the most part I control the image acquisition by manipulating the camera to produce an image I like. I have a bunch of constraints on what I can do. Time: thousands of academics have talked about duration of learning through media. So listening to their wisdom and adding my own experience I try to keep video down to 6 minutes or less. Digestible bits. Size: High Def video takes up a lot of room. So I have to balance files size vs quality vs frame size. Full HD on the camera I use shoots 5gb per minute. So a 10 minute raw video is 50gb. I have settings on my camera I can use to reduce this, but this file size doubles because I have to back it up. So one copy of the file goes into special backup drive, and the other file on to my system. Then the editing software makes a nice editing friendly version, so more file space is used up. Wait, wait, wait. I seem to be heading down a rabbit hole of technical detail. Maybe I will save that for another post. Suffice to say I have to try to keep file size down and quality up which is a balance. Space: Where to shoot is a constant struggle. Doing interviews often lead to the clichéd look of professor sitting in front of a wall of books. We have no actual studio space on campus. Often I book a meeting room which can work well. Although bus noise can be an issue since there is a bus stop just outside of our building. I try to keep the look of the visuals more simplistic and clear. Limit camera movement, subtle lighting, clear audio. The work I do is nicely varied; sometimes planning and shooting chemistry lab scenarios for students working on their chemistry labs at home, sometimes interviews with subject matter exports on topics ranging from pre-confederation history to Aboriginal taxation issues to overviews on the work of Plato. Am I bragging? No, am I having fun? Yes. 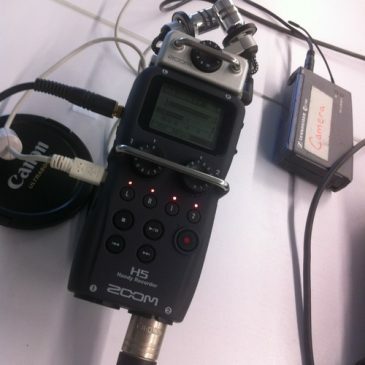 Simple task: Help Brian and Alan capture audio of his Tuesday lecture for the Google Hangout session. Couple of problems presented immediately; one, how to get the best quality of Alan’s talk and still get decent audio of the room since people will be answering questions and Alan will be playing video clips to the room. I have a couple different workflows for when I am recording this type of thing on video. The camera I use has two XLR inputs so I connect a lav or lapel microphone to one input and another microphone to the other. I can monitor the audio levels visually and with my headphones. Great but for this set up we are not using a video camera, and the audio needs to go into Brian’s laptop. Ah ha, the new Zoom H5 audio recorder can act as an audio interface, meaning it is not acting as a recorder but as a mini mixer. Haven’t used this device a lot yet, but I know I can input the lav into the mini-jack input and two other mics into the xlr inputs. Perfect, small and portable elegant solution. I set up one omnidirectional mic to capture the room sound, and hook up a lav onto Alan. Okay, why aren’t I hearing anything from the room mic? Levels are up, power to the mic is on, input is correctly set. WTF? No sound from the mic. Shake the cable and notice static on the meters. mmm. Un plug cable and try another cable. Luckily I was taught to always bring extras. Yup it’s the cable. Whew. Room microphone is not the best set up, the room itself is noisy and is made even noisier when I have to turn up the gain to hear questions from the back of the room. But crystal clear audio on Alan’s voice which is really what is important. So again, I learned that I don’t prepare enough and I can think pretty fast on the fly and usually solve problems as they arise. Scary. Once I got to the office I figured out that I could have plugged both the lav and the area mic into the xlr inputs on the bottom of the H5 and then also used the built in x/y microphone on the top of the device. Next time.